Lucy's Cards: Happy World Card Making Day - A Card AND a Giveaway! Happy World Card Making Day - A Card AND a Giveaway! But first, a card in celebration of this happy holiday. This card is made with more of the yummy Simon Says Stamp Stamptember releases. The Small Forest Tree die is adorable - so delicate, and the heart die is going to be one of my most useful new finds - love that it has stars too. :) That pretty sentiment is from The Handwritten Sentiments set designed by the fab Kristina Werner (isn't she just too amazing...) The script background is Hero Arts Tapestry Background, it coordinates with the pink paper from the Kissing Booth pad by Basic Grey. Oh, and I used Wet Cement ink to stamp that background - it looks awesome on kraft. The other papers are from the October Card kit exclusive 6 x 6 pad. I added Glossy Accents to the hearts too for some shine. All these products are delicious, unopened and just waiting to be played with. Leave a comment here by next Saturday 13th October and be in with a chance of winning the lot. I will mail anywhere in the world. It is WORLD Card Making Day after all! I will announce the winners on the 14th October. So... what are your plans today? Thanks for the chance to win this beautiful package! I love the hearts! I also like how you used white as your tree color!! Thanks for the chance!! Have a great time card making today!! Love your card Lucy. Isnt' it funny how we are always needing new stuff and then don't get to use it? I'm going to try and use some stuff today and create one or two cards. Happy World Card Making Day. Hope Lily will allow you some crafting time today LOL. Such a pretty card, I love the subtle backgrounds on the tree and the Kraft - gorgeous! Thanks or the chance to win and Happy Card Makng Day! And what a beautiful card, wauw! Thanks for the change to win this gorgeous package. Happy World Card Making Day!! That card is WONDERFUL! I love your colors.. Its just perfect! Plans for the day ... Well... I have to go out and get some grocery shopping done, but I'm going to do that early! I hate shopping LOL I also have to get my youngest black dress shoes and a white shirt for her chorus concert on Tuesday. Other than those errands that have to be done, I will be sitting at my desk getting some cards made :) I have some colored images that are just waiting for me to make into cards. Hopefully I will get something done today! Thank you for the sweet candy! Beautiful card and a great giveaway. I'm working today so I have not much time to craft but I'm going to visit lots of blogs today. LOVE the card...a heart tree..who knew? Your card making is divine Lucy! Love all the goodies...thanks so much for the chance to win! I'm a huge fan Lucy. Your creativity is just inspiring. Thanks for the giveaway! Woohoo! You know how to celebrate;). Love those glossy hearts!! What a cute card. I've been celebrating Card Making Day all week. Made several Halloween cards, a sympathy card and a card for a baby shower I'm attending today! A lovely card, Lucy! I think the red is so vibrant against the kraft and looks amazing. Thanks for the chance to win such an awesome giveaway. What a gorgeous card! 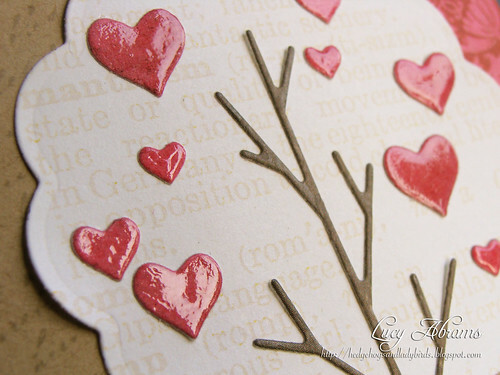 The tree looks so cute with the hearts, and I love the paper that you used on the background. Thanks for a chance to win! Gorgeous card, Lucy! I love how you used the circular die to create a full tree. :) I've got an upcoming card post where I've given the hearts some glossy accents love too. ;) Happy WCMD to you! lovely card, and amazing goodies up for grabs! unfortunately I won't get chance to craft today as saturdays are family days and we're off to Blackpool illuminations! What a sweet card. I remember the days where I couldn't craft because the kids would get into it all, now they crafts with me! Time goes by so fast! I'm planning to make cards this morning and later after my son's soccer game. those hearts are just so cool!!! planning on going to the Peanut festival with family then back home to craft!!!! Happy Cardmaking Day! Your card is sweet - love the Kraft and red. Thanks for the chance at a lovely giveaway. I love the tree of hearts as well as the subtle texture you add to each layer. Beautiful! Love the card. Great background paper. 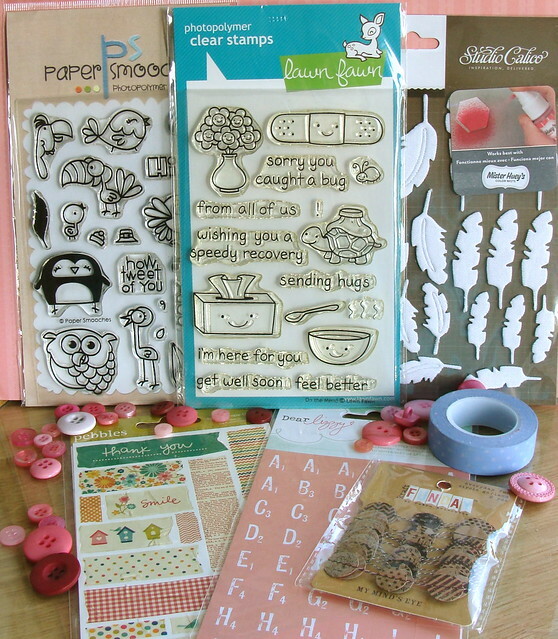 I'd love a chance to win this stash on World Card Making Day! Wow Wow WoW ! Yummy stash - would be great this time of year in UK all my friends have colds! Happy Card Making day - off to make a few . Happy World Card Making Day! Lovely card and fantastic giveaway. Thank you for a chance to win! Gorgeous card and I love the shiny hearts! Thanks for the chance! Ger x.
Gorgeous card! What awesome blog candy! This card is gorgeous! I love the colors and the stitching is perfect! Wow, what a fabulous giveaway! I don't have any of these products and it would be so fun to try them out! Today I'm also getting crafty- I couldn't pass up creating on WCMD! Love your card Lucy. The colors and the stitching is perfect! world card making day ! Such a very sweet card! Happy World Card Making Day to you too! I just love those hearts! WHat a lovely card! Happy World Card Making Day. I have blog candy too-so be sure to check me out! I really admire your work. clean and perfect. happy world card making day! On French : adorable petite carte !!!!! J'adore! Great package. Thanks for the opportunity, would love to play with all the products. Seriously LOVE your card and I think I need to get those dies. WOW. Love the hearts especially. Your cards are gorgeous!!! Thanks for giving us the chance to win your 'give-aways'! Your cards are all so inspirational and this one is no exception. I love following your blog. Thank you for sharing your cards with us all and happy WCMD. I love this card... so pretty! Happy World Card Making Day! I can clearly see I NEED that tapestry stamp, great card!!! Great card and love the whole look. I love how you come up with awesome cards each week. I always look forward to them and sorry I dont comment enough. I plan to play in my craft room today get some DT cards made and found a cute mini book on U-tube I have been wanting to make so going to give it a stab.. Have a great day. Happy world card making day. Great giveaway.. thanks for the chance. Stunning work as per your usual! Love it. That tapestry stamp is lovely. :) Happy WCMD! To celebrate, nothing better then shop some suplies and make card! That's exactly what i will do! Thanks for the chance! Great giveaway! Sweet card! Happy world card making day! I'm dying to make a card or two and join in the fun with everyone today. Maybe I should stop poring over these fab blogs and get to work. Love the background stamp on that kraft too, on your featured card. Hi Lucy, I just LOVE this card and your last one; You've inspired me to get busy using some of the items from the SSS card kits and dies I've purchased! Thanks for the chance at this fun blog candy! The most adorable card I have today. I combines stamping, die cutting and stitching - all I love to do. Thank you for the chance to win. Beautiful card indeeed.. those tiny shiny hearts looks awesome. Thanks for the chance to win too. Happy Card Making day you too. Your card is so pretty! Makes me want to get crafty! i LOVE that card! how creative to make a heart tree??? Thank you for your generosity, Lucy! Your cards are always immaculate! Love your style! Great card and great giveaway Lucy. Thanks for all the years of inspiration! I was recently musing on what I would do with all the cards I make if I didn't have 5 kids and 18 grandkids...not to mention 33 million other folks...hahaaa! Makes me happy to think that you will have so many years in which to create so much for your sweet baby girl....enjoy! Love the pretty card, and thanks for the chance to win that fabby candy! Adorable card and such amazing goodies. Thanks for the chance to win. Love the blogo and thanks for the chance to win. Such cute stamps and I have seen you use the tree stamp before, love it! Great card - I just love that die!! Thanks for the chance to win! Beautiful card, love the colors. Happy World's card making day to you! I love the card in this post. It makes me feel nice and warm :-) Thank you so much for the chance to win such a great bunch of goodies. I'm staring at the Lawn Fawn set. It's great! Wow I love this tree card you made! So much so that I subscribed to your blog. Love the colors, the paper and the hearts! Stunning card! Love the card! What a nice giveaway. wow what a candy! Thanks for the chance to win. I love your card, love that you added glossy accents on the hearts. Such an adorable card..as always!! Thanks for the chance...it's time for cardmaking... !! Love your beautiful card. Thanks for the chance to win. Goodness, I'm positively smitten over your card, Lucy. Makes my heart go pitter-patter and my toes curl! This is a beautiful card! Thanks for the chance to win! what a beautiful card Lucy. The hearts are just beautiful and I love the background paper from Basic Grey. Thanks for the chance to win some goodies. You are very generous. Lucy, I adore your card! Those hearts are divine. Great giveaway, too. Thanks for the chance. Love, love, love the hearts card. I had to buy the small AND large tree die because of you and Jennifer. First of all.....fabulous card!! Love what you did with the hearts. Secondly, thank you for this awesome giveaway. I spent WCMD making calendars for this Christmas' holiday gifts. Lovely card. Thanks for a chance to win too! What a beautiful card. I love the hearts in the tree. Such a cute card...love those dimensional hearts! Great card - love the glossy hearts. You are very generous. Thanks. Gorgeous card, Lucy. Love your style. Thanks for the chance to win. Happy WCMD! I LOVE your card! It's stunning! I love the colors and the hearts! Gorgeous! Lovely card, love the hearts and the gorgeous design paper. Thanks for a chance to win your generous giveaway! I love your style of card making. Simply gorgeous! 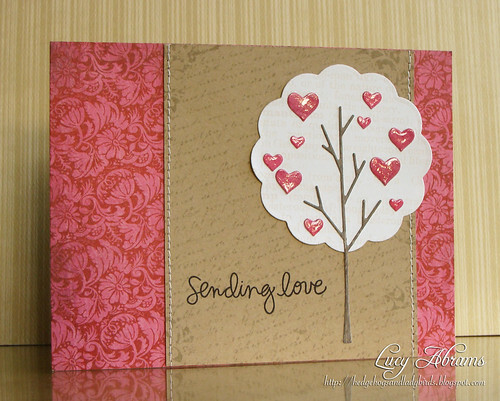 I love the hearts on the tree of this card. I spent too much time looking at everybody else's blogs and cards to actually make any yesterday but hope to do so during the coming week. Lovely idea with the tree, but honestly I love almost every card you make. Before I was creating myself I ame to look around on your blog almost every day... You really inspire me! Thanks for a chance to win some products you like! Beautiful card! Love the leaves! Thanks for the chance to win! What a sweet card! Thanks for the chance to win. Oh I just love the hearts card. Perfect for any occasion or any holiday. Thanks for sharing. Love design - colors, tapestry, script, stitching, and shine on the hearts! So enjoy all your cards. Thanks for chance to enter - love all items. Love the hearts in the tree and the 3D effect it has!!! Great card. Love the glossy hearts. What a beautiful card! the sweet hearts are lovely with their glossy finish! My daughters and I spent the day crafting yesterday (I bet you are looking forward to those days with Lily!) so today I'm catching up on all the WCMD posts. Phew there's a lot of beautiful out there!! Beautiful card! Thans for the change to win. Greetings from the Netherlands. I'm here every day. If not I comment on. You're beautiful greetings. You are my inspiration! Beautiful card with the 3D shiny hearts! Thanks for the giveaway--the stamps are so cute! Love your card - the design, how and where you use patterns, and that touch of glossy! And that's some generous giveaway. Thanks for the chance. Such a sweet card, love those glossy hearts! And such a generous giveaway, thank you so much for the chance to win. As a beginner (making cards) your cards are definitely inspiring. I look forward to visiting your website to continue to be inspired! What a beautiful card! You are so generous too! Wow what an amazing gift for a give away thanks!!! I love the glossy accent hearts! So fabulous! Thanks for the chance to win. Wow, what a sweet card! I love the colors and the glossy hearts! Thanks for the chance to win these goodies! And Happy World's card making day! Hi Lucy, love your cards! I made a welcome card for my daughter's new teacher, who is starting today. Unfortunately I forgot to take a photo. Oh well...thanks for the chance to win! just wanted to say i really like i found your blog, and you're beautiful cards. unfortunately i had to attend some kids sport activities on WCMD, but in the evening i enjoyed playing with my new wplus9 stamps and i loved it! Love your blog, love your card, and would love the chance to win your blog candy! Such a pretty card and love how you make the tree! Thanks for your generous giveaway! Loving your card, especially the use of Kraft card. I'm a great fan of your style and get lots of inspiration from your cards. Many thanks for the chance to win all the fab goodies. OMGosh Lucy, I just found your blog and I love it! You have such an up and happy place to be! I look forward to reading you on a daily basis and getting lots of great ideas. Thanks for teh chance at this wonderful blog candy too! I get such a happy feeling and a smile on my face when I troll the card making websites. The hearts are cool with the glossy accents. A simple card but a lot of impact. Well done!! I came to your blog from Simon Says Stamp's blog because I like the card you made for them. I know I'll be back because I like LOTS of your cards here. Thanks for the chance to win a wonderful package of goodies. Hi Lucy: I really like the soft colours of your card, and it would be perfect for valentine's day too!I made a couple of baby shower cards the other night and am looking forward to scrapping my daughter's first baby expected in Dec.! Thanks for the chance to win your goodies! What a great card. I really like your card making style! Sorry I missed WCMD but thanks for the chance to win some fun supplies. I want the Lawn Fawn stamp set so badly. Unfortunately, I was not able to participate in National Cardmaking Day. Crashed laptop and all that jazz, but I love seeing everyone's creations. Thanks for the opportunity to win this awesome haul. the card is very very lovely!! Your card is great! The little hearts on the tree are just too cute!!! Thanks for your generous giveaway. The products look lovely and I would love to win. I discovered you recently and have been a fan ever since.. You are so creative and I so love the cards you do. I got interested in card making like last year and love it so much. I live in Sri Lanka so it's very difficult to get hold of materials. We dont even have a scrapbooking store :) so would really like this kit. Thanks so much for your inspirations. Great card. Thanks for the chance to win. Loved the card! Hearts in trees are one of my favorites. Lovely card! Loving the glossy on the hearts! Found you while hopping for Mama Elephant. Love your blog! what a beautiful love card! So pretty! Love the glossy hearts. Wonderful card - as always! Thanks so much for all the inspiration you share and for the chance to win! Happy WCMD! Thank you for the great giveaway! Thank you so much for the great give away! Your tree with hearts is darling. And, thanks for the chance to win that fabulous prize. Love your card! Thanks for a chance to win. What a beautiful card! I love the glossy hearts and pretty colors! I just found your blog and love it! Thanks for the chance at this generous giveaway! Love the hearts!!!! Thanks for the chance to win! Am getting to enjoy all the cards today!! Love the kraft with the shiny red hearts!! REally pops!! Thank you for the giveaway! Love the tree and the hearts! What a wonderful stamps and goodies ! thanks for a chance to win! What a great card! I love the sweet tree! Best wishes from germany and have a nice weekend! Love your blog! Thanks for the chance to win. This is so very generous of you :) I love visiting your blog for inspiration. Your card is so pretty--I like the glossy accents on the hearts and the script background. Thanks for the chance at this wonderful giveaway. Tis the Season... for BLING. Mama Elephant Grand Opening Stampede!